The Battery Management System(BMS) is one of the most important components in your electric scooter. It is commonly located inside the battery pack. Keep the cells in balance at 4.20V at full charge. To understand how the BMS works, we first need to understand how the individual cells in a battery pack are connected. There are 2 ways to connect the individual cells in a battery pack together. Each 18650 cell has a negative and positive end. If we connect the positives ends together and the negative side and the negative ends together, they will be connected in parallel and the capacity(Ah) of the cell and the discharge rate of the cell to double while the voltage remains that of only 1 cell. If we connect the positive end of one cell to the negative end of another will result in them connected in series, causing the Voltage to double while keeping the Capacity(Ah) and discharge rate of the cell the same. The majority of lithium-based cells that you will find in ebike battery packs have a “nominal” or average voltage of 3.7V per cell and for every group of cells in parallel. They can be fully charged to a voltage of 4.2V per cell, which is considered” full” at 100% State of Charge(SOC). They are commonly considered to be “empty”, at 0% SOC when they get down to 3.0V per cell. Monitoring the cell voltage of each cell in a battery pack is essential to determine its overall health. All cells have an operating voltage range where charging/discharging should occur to ensure proper operation and battery life. If an application is using a battery with a lithium chemistry, the operating voltage typically ranges between 3.00 and 4.20 V. Voltage range is chemistry-dependent. Operating the battery outside the voltage range significantly reduces the lifetime of the cell and can render it useless. The BMS consists of a few MOSFETS that behaves like switches that be turned off when the voltage of a parallel group of cells gets too high or too low. A simple way to determine if a battery pack is charged is to monitor each parallel groups of cell’s voltage to a set voltage level, usually 4.20V . 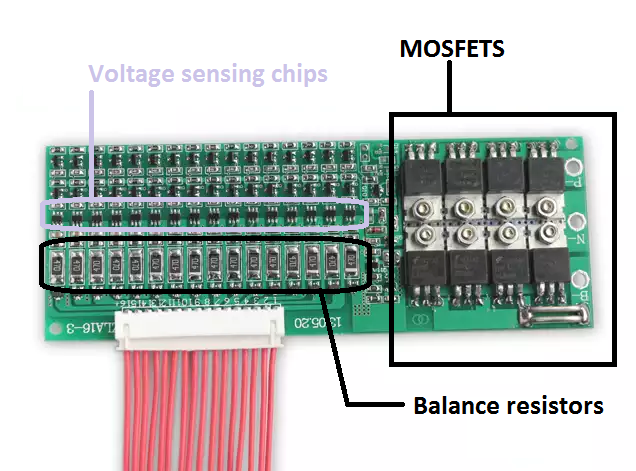 The first cell voltage to reach the voltage limit trips the BMS’s overvoltage limit, causing it to do a High Voltage cutoff(HVC) where the MOSFETS disconnects the battery from the charger. A weak cell in a battery pack will reach reaching the limit first, keeping the rest of the cells from fully charging. In order to get all of the cells charged to 100% SOC at 4.20V, the groups of cells in parallel must be balanced to the same voltage by the BMS. The BMS typically achieves this by using balancing resistors to drain all of the group of cells to the voltage of the lowest group of cells to allow the charger to continue charging the battery. This is done so by turning on the transistor that controls ‘bleeder resistors’so that it can start draining the groups of cells at the High Voltage Cutoff point fully charged to allow the others to continue charging. One of the ways that a BMS could fail is that the transistor that controls the bleeder resistor could fail, causing the group of cells to completely drain to 0V. Most BMS limit how many Current (A) can be drawn out of the battery pack by changing the number of mosfets on the BMS board. This is done so to ensure that the battery does not get too hot and get damaged from discharging at too high currents. Temperature monitoring of a battery pack. During periods of high discharge, the battery pack may get very hot. The BMS may have a thermocouple onboard that senses the temperature of the cells and cause it to stop the battery from discharging when the temperature is too high. ON/OFF Switch. The on off switch of a electric scooter is usually located on the throttle that is connected to the handlebar, but it is also possible to have a on/off switch on the BMS as well. Bluetooth connectivity: Some BMS has processor chips and bluetooth module onboard that relays information to your smartphone to let you know the status of the battery such as Voltage of each group of cells and charging or discharging current.